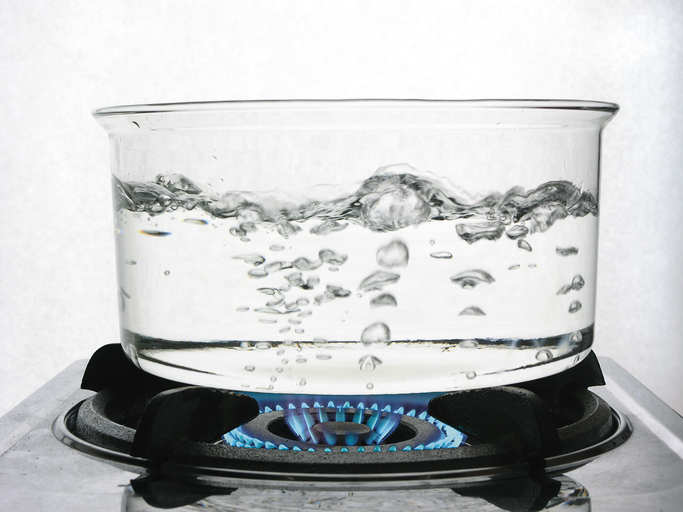 You might already know that to boil means ‘to change from a liquid to a gas as a result of heat’ and, in everyday life, ‘to cook or be cooked in boiling water,’ or ‘to hold boiling water,’ as kettles do. Figuratively, to boil means ‘to be in an agitated or violent state’ and also ‘to be in the grip of a strong emotion,’ usually anger, or, when we are talking about emotions, ‘to seethe or bubble.’ As a noun, a boil is the act of boiling, but also a painful swelling on the skin having pus inside, usually caused by an infection. Boil the potatoes for ten minutes. The vegetables are boiling in the pan. The kettle is boiling; can you turn it off, please? The sea was boiling in the storm. Resentment was boiling beneath Justin's calm exterior. Bring the water to the boil before adding the pasta. Amanda went to see the doctor about the boil on her leg. If you say someone’s blood is boiling, that means that person is very angry. Boiler Room is also the name of an online music platform that broadcasts live music sessions hosted in around 100 cities worldwide. Boil, meaning ‘to bubble up or effervesce’ (especially due to heat) dates back to the mid-13th century. The Middle English noun boillen came from the Anglo-French boillir (to boil, bubble up, ferment or gush), from the Middle French boullir and the Old French bolir. It can be traced back to the Latin verb bullire (to bubble or seethe), from the Proto-Indo-European root beu- (to grow or swell). The meaning ‘to cause something to boil’ dates back to the early 14th century, while the figurative senses regarding feelings and emotions all date back to the mid-17th century. The noun, meaning ‘the act of boiling’ or ‘the state of boiling,’ comes from the verb, and dates back to the early 15th century. The other sense of the noun, ‘a painful swelling on the skin,’ is older. It dates back to before the year 1000. The Old English noun byl or byle (Middle English bile or bele) originally meant ‘boil or carbuncle,’ and came into English from the West Germanic buljon– (swelling). It can be traced back to one of two possible Proto-Indo-European roots, both meaning to grow or swell: beu-, which would make it related to the other senses of boil, or bhel-, which would make it related to the Old Irish bolach (pustule), the Gothic ufbauljan (to puff up) and the Icelandic beyla (hump), as well as English words like bale, balloon, boast, bold, boulder, bowl, bulk, bull, full and fool.